As Directors and Officers, usually, the membership sees us doing various tasks around the museum, usually in work boots and overalls, getting dirty, or performing various administration tasks, attending meetings, etc. Yep. That’s our job, what we signed on to do to serve the membership and our favorite little railroad. However, it’s not ALL work. Last Saturday, July 28th, I had the pleasure of spending time with a few other FRRS Officers and Directors while sharing in one of our extended families proudest moments. 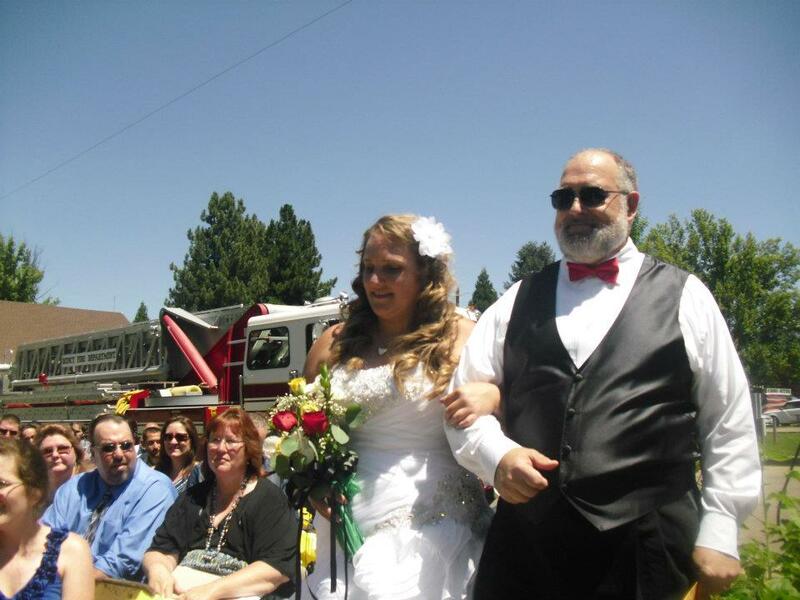 Kathy Habeck, daughter of FRRS Vice President and Director Steve Habeck, married Quincy Firefighter Kevin Errecart in a beautiful ceremony in nearby Quincy. Those of you who have ever been to the museum more than once, probably believe that Steve and FRRS president Rod McClure, don’t own any other wardrobe that doesn’t include bib overalls. I wondered that on more than one occasion myself. Bet most of you also didn’t know that Rod is also a non-denominational ordained minister. Imagine the shocked looks when stepping out of our cars at the Quincy Fairgrounds last weekend to see Rod in a pin striped suit. Yes, ROD in a suit. And it wasn’t made of denim, nor did it have shoulder straps. An honest to goodness suit with jacket, tie; the works. And he looked sharp too, if I do say so. Just as the shock started to wear off, up walks Steve. In a tuxedo. Steve HABECK. Yeah, THAT Steve. Gail McClure & Alicia La Brecque were dashing as ever, both rockin’ beautiful new dresses. I’m used to seeing Alicia all dressed up for work, and Gail is always looking great, but to look around and see everyone dressed to the nines for this special occasion was a little surreal. Rod officiated the wedding and married the beautiful bride to one of the nicest guys you’d ever have the pleasure of meeting. Rod was a little nervous, as this ceremony was the first he had performed. 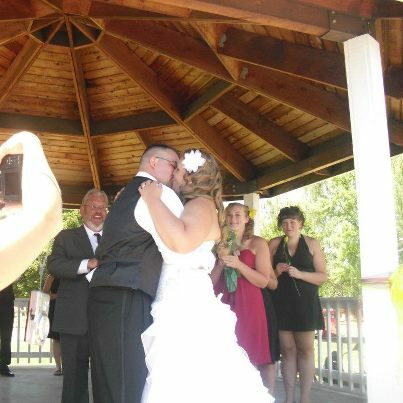 We laughed and joked about it prior, but when the bride walked down the aisle, Rod was all business and did a beautiful job. To say I was proud of my friend is an understatement. Anyone who knows Rod knows his warped sense of humor and he’s always joking and laughing, so it was a pleasant surprise to hear such a beautiful sermon while he bonded Kevin & Kathy in holy matrimony. Steve was understandably walking on air. It was a pretty neat day all around. The whole point of this is to remind everyone that despite anyone’s “title” at the museum, or our “jobs”, “tasks”, etc., we’re a great big family and people too. We have lives outside of the museum and even the railroad. That’s one of the magical qualities of a railroad museum: The railroad. It’s never been a “job” (even to the non railroad employed volunteers, it feels like a job sometimes working at the museum). It’s a lifestyle. And friends are more than just friends. They’re Family. 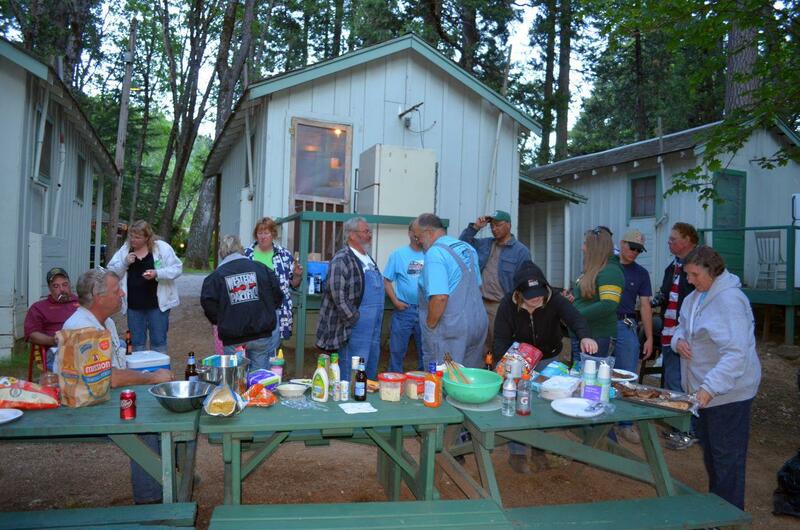 During Dunsmuir Railroad Days, we had a huge barbeque and partied our tails off. It was a great way to “decompress” after a long week of preparation and work to bring the Western Pacific Railroad Museum to the town of Dunsmuir for the event. Everyone had a great time and we have decided to make this an annual tradition at each of our off site road trip events. We all work hard to make the museum what it is, so we need this quality time together to “recharge the batteries”, and regain the strength and energy to continue with even the most mundane tasks around the museum. I encourage all of our volunteers to spend time together away from the museum or museum work. We have a lot of fun, and it is a great way to keep the passion for rail preservation going strong.